‘Beer – the cause of, and solution to, all of life’s problems’ as the modern philosopher Homer Simpson once succinctly observed. 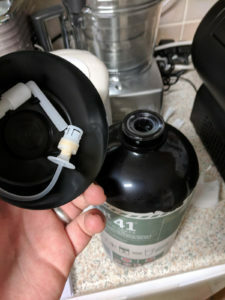 A pint of the good stuff is wonderful (in moderation), and as a fan of both excellent beer and handy home gadgets, I couldn’t wait to get my hands on the latest affordable system for pouring the ‘perfect pub pint’ in the comfort of my own home. 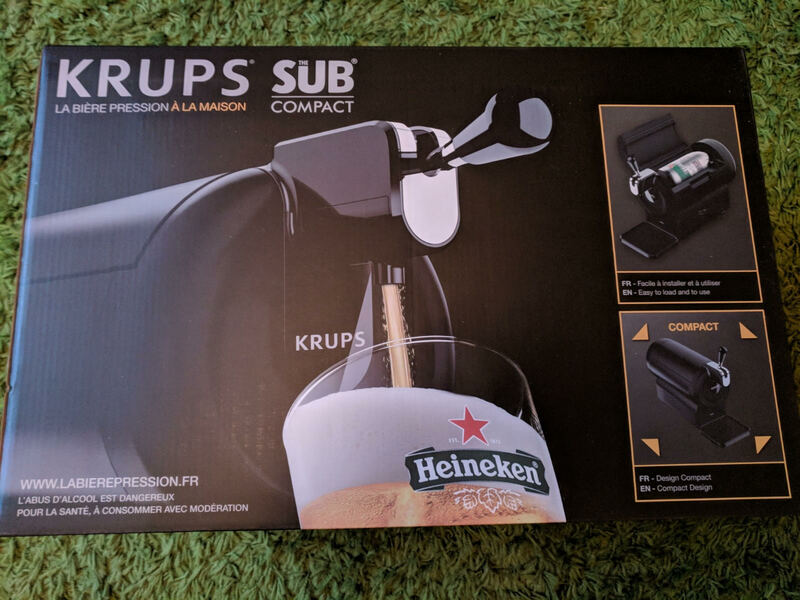 You’ve probably heard of Krups before, as they are big players in the coffee-pod appliance world, but now they have teamed up with Heineken to bring you a kind of coffee machine for beer. The basic idea is that you buy a ‘Torp’ of beer (yep, there’s a nautical theme), which is a sort of stubby 2 litre bottle, then pop it into the machine, wait for it to cool down to 2°C, and pour away. 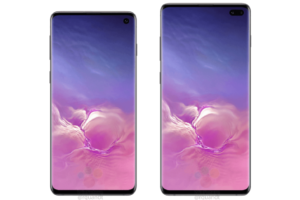 It’s a great idea, and it’s the first attempt at a reasonably-priced option that most people will be able to afford (I have the Compact version, which offers no discernible difference to the big one other than being slightly smaller, and was around £50). There are a few fancy-pants home draught systems that go for anything from £100 – £1500 upwards, but for your averagely-financed normal person, this system ticks quite a few boxes. After opening it I didn’t have to read the instructions to understand how it went together (always a sign of good design) and it was soon perched on the kitchen counter waiting for a Torp. A word of warning – I might have the ‘Compact’ one but it is certainly not small, and you need some room either side of it for the cooling fans to work properly. The Torps contain some sort of tubing that feels a bit like you’re performing some sort of weird beer-related surgical operation, but it’s not too complicated to get it working and whirring away while it busies itself with chilling your beer. 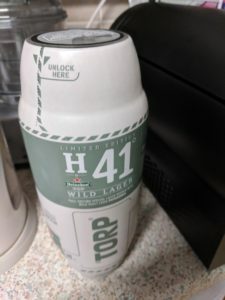 If you put the Torp in the fridge for a few hours before transferring the Sub, it’s supposed to reduce the time that it takes the beer to reach ‘optimum temperature’, but either way – it takes Really Bloody Long. Honestly, this was one of the most disappointing things about the whole thing – having placed a Torp in the fridge for over 6 hours, and then moved it into the Sub, I was still looking longingly at the Red Light of Beer Denial over two hours later. This might have had something to do with the fact that I was doing this during the Great British Meltdown of 2018. Which meant that I was so hot and sweaty for 98% of the time that I would have sold my own nan for a pint of extra-cold, refreshing, golden beer. Because of the heat, I was much more desperate for a cold beer – and also because of the heat, my new toy was much less willing to dispense it. So I trudged off to bed without having tried my new kitchen-based homepub. 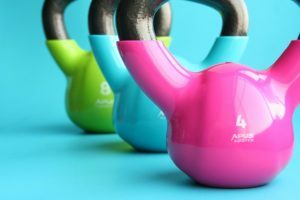 But by the next morning the light was green for go, and once I got home after another sticky-hot day at work I strode in through the door, ignored my wife and toddler and headed straight for the Sub. Oh, reader, it was fantastic. The best beer I have ever been able to pour in my own kitchen. Easily as good as a decent pub-pint, and a damn sight better than some beers I’ve been served in dodgy establishments. Recommend, recommend, recommend. And there’s loads of different beers available, not just lagers – there’s strong IPAs and wheatbeers as well. At about £8-9 a pop, it’s not cheap though (they have top make their money somewhere, don’t they?) so all in all it’s a little bit of a luxury to have the perfect pub pint at home. But – what a pint. Fantastic. A great treat for any beer-lover. 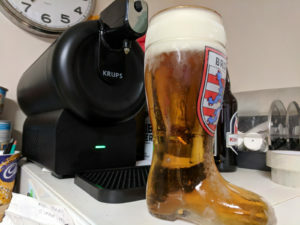 What better to complement the Sub than Das Boot? 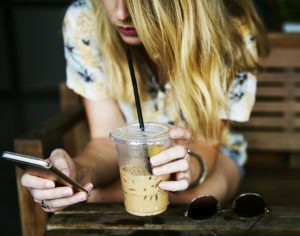 How I Use My Smartphone Each Day – Am I Addicted to My Phone?